As registered with Yoga Alliance, E-RYT 200 is able to provide continuing education classes and workshops to other teachers and can be a Lead Trainer of a 200-hour teacher training. 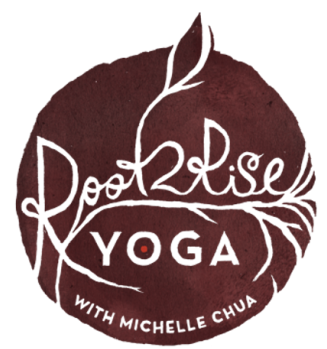 Passionate about movement from and for the soul, Michelle Chua sees yoga as the practice of harmony between heart wisdom, bodily expression, peaceful mind, Mother Earth, your surroundings and its diverse beings. Valuing freedom and happiness, she celebrates life with love: dancing to live drums, meditation-running in nature, eating delicious plant-based cuisine, laughing as much as possible, traveling and discovering various cultures, appreciating miracles in simplicity and most recently, playing with her newborn nephew and his uplifting pureness. Michelle entered her first yoga class in 2001, and earned her yoga teaching certification in 2010, after experiencing deep lasting benefits during challenging times: a yearlong recovery from a dance injury, grieving the loss of loved ones and living abroad to volunteer teach in Ghana, West Africa, and Costa Rica for 14 months, the latter where she served as a Teaching Fellow for WorldTeach. During her previous 7-year career as a credentialed schoolteacher, she co-founded her school's annual Multicultural Festival, infused yoga practice in the classroom and led professional development on integrating standards-based arts and physical education with core curriculum. As yoga teacher, she furthered her studies with experts on Mindful Leadership, Yoga as Lifestyle, Creative Yoga Sequencing, Yoga Hikes, Freeform Movement as Meditation and more. Her love for and diverse background in education, movement and art, influence her ability to clearly facilitate yoga for different ability levels and effectively organize and lead dynamic enriching yoga retreats, arts-integrated meditation workshops, soul movement (freeform dance), wellness-centered community events and private and public yoga classes through the community business, Root 2 Rise Yoga, which she founded in 2010. Having earned her Bachelor of Arts in Liberal Studies and Multiple-Subject Teaching Credential with a Concentration in Art, Michelle encourages exploring creativity with the spirit of your adventurous, open-minded and appreciative inner child. She believes that living yoga empowers your ability to root into your magnificent inner uniqueness and our universal consciousness to rise together as our most vibrant selves. She seeks to evolve daily through living her yoga practice to serve as conduit of inspiration, body wisdom, pure love and inner peace for the communities she is blessed to learn from. Michelle has a way of making you feel like you've come home in her classes. Not to a space or a location - but to yourself. Beyond providing a personalized critique of my practice, she continually offers a philosophical structure for personal inquiry and growth. One student wrote, I felt well-instructed, confident in my poses and really empowered afterwards. Another explained, I was so focused on the movements and felt each of them in my body. In fact, I have never felt so true to my emotions. Another described, The peppermint oil, soothing sounds of rain, darkness and the sound of my own breathing enveloped me, and in that moment, I felt grateful for the chance to experience something like yoga.